On Saturday, Nebraska lost in overtime, 36-33, to the Hurricanes in Miami. After being down 33-10 with just over 11 minutes in the game, Nebraska stormed back with three touchdowns to tie the contest. But on the first play in overtime, Tommy Armstrong threw an interception, and a personal foul by left tackle Alex Lewis for a late hit set Miami up for a chip-shot field goal to win the game. Tommy! Armstong’s numbers weren’t the best. He was 21-for-45, for 309 yards, four touchdowns, and three interceptions. But those numbers are a little deceiving, as Armstrong was plagued with drops early in the contest. But the statistics almost don’t matter. Armstrong was Nebraska’s best player on the field, and it was on his shoulders – and his legs – upon which Nebraska was able to make a comeback. Yes, it was his mistake that functionally ended the game. But without Armstrong, Nebraska gets blown out. And even in a loss, this was Armstrong’s coming-out performance as a quarterback that can get Nebraska to Indianapolis. The Comeback. Anyone else have a flashback to Michigan State last year? Or Iowa? After looking punch-drunk at times in Miami, the last eleven minutes of regulation showed the kind of potential this new-look offense can have when it is working. It showed that the mental toughness Nebraska showed last year. And it showed Nebraska would not allow itself to be embarrassed on national television as it had been last year. Brown’s Bomb. When Drew Brown trotted on to the field in the middle of the second quarter, it felt more like a surrender. Nebraska had been blitzed for 17 points in the first quarter, and was only able to get the ball to Miami’s 32 before needing to kick a field goal. And seeing Brown take the field did not inspire confidence. Two weeks ago, it was Brown missing a 40-yard and a 41-yard field goal that put BYU in a position to win the game on a Hail Mary. So Nebraska fans were justified in holding their collective breath when he swung his leg at a 49-yarder. But Brown’s kick was true, and would have been good from over 50. It ended up to be very important in the game against Miami. But perhaps even more importantly, Nebraska fans – and coaches – have now seen Brown take the field in a hostile environment and be true from long distance. Even in terms of decision-making and giving coaches enough confidence to give him a chance in the future, that’s a big deal. Another Bad Quarter. Against BYU, Nebraska gave up 17 points and looked like it was helpless defensively in the second quarter. Against Miami, the Blackshirts’ dreadful 17-point performance came in the first quarter, and put Nebraska on its back foot the rest of the game. Yes, Nebraska was able to staunch the bleeding, making schematic and personnel adjustments to neutralize (at some level) Miami’s offense. But Nebraska’s propensity to get bombed early in a game is distressing. A Bad Mix. A smart and particularly handsome analyst pointed out that the lack of a pass rush and the struggles in the secondary go hand-in-hand. That dynamic was on display again on Saturday. With a four-man rush, Miami quarterback Brad Kaaya had all the time in the world to wait for his receivers to come open. And while Nebraska’s secondary (particularly Daniel Davie) struggled, it’s unfair to ask them to play single coverage against talented receivers for as long as they are being forced to do so. Nebraska has answered with some blitzes and additional safety help in coverage, which seemed to make some improvements later in the game. Yellow Rain. And, they’re back. Nebraska improved – sort of – its penalty-committing ways against South Alabama in game two, going from 12 penalties for 90 yards against BYU to 7 penalties for 80 yards against the Jaguars. But against Miami, the numbers blossomed to the worst performance of the year, 12 penalties for 98 yards. And while some of the penalties were of the spectacularly foolish and damaging kind (looking at you, Alex Lewis), many were still disturbing signs of a transition not yet complete. Nebraska was caught numerous times with an illegal formation on offense, and a substitution infraction for 12 men on the field. Lewis ended the game with two (!) personal foul penalties and an ineligible man downfield. In fairness, Miami was worse, with 13 penalties for 114 yards, including two ejections for targeting fouls. 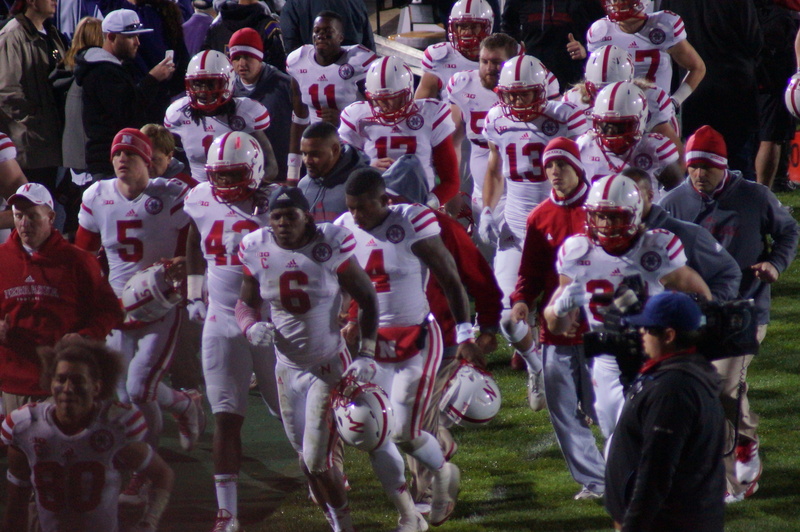 But given how razor-thin the margin was, even a slightly cleaner game from Nebraska might have made the difference. After the first quarter against Miami, it seemed ludicrous to think that Nebraska would win another game, much less a divisional title this year. It was that bad, reminiscent of the embarrass-the-program performances that ran Bill Callahan and Bo Pelini out of town. But, much like with BYU, Nebraska was able to steady the ship and come oh-so-close to a grand comeback. The win puts Miami at 3-0 in a navigable ACC conference. BYU is 2-1, with a one-point loss in the Rose Bowl to a UCLA squad many (like Kyle Bonagura of ESPN) are projecting as a playoff team. Take a look at the rest of Nebraska’s divisional foes. Wisconsin has been far from impressive, most recently beating Troy 28-3 in Madison. If the Badgers are relying on the arm of Joel Stave to win in Lincoln, Nebraska fans have to like their chances. Minnesota, after raising a few eyebrows with a game effort against TCU in week one, haven’t looked worldbeaters either, recently squeaking by Kent State, 10-7, at home. Northwestern has the best resume, by far, with its 16-6 win over Stanford (made even more impressive by Stanford beating USC in Los Angeles) and a 19-10 win over Duke on the road. Iowa has held serve as well, including wins over an Iowa State squad that regularly gives the Hawkeyes fits and an Alex Henery moment in beating Pitt with a walk-off field goal. But both Northwestern and Iowa are in Lincoln. Yes, Michigan State looks like a big ask for Nebraska, but it is unlikely that any B1G West squad will have a perfect in-conference record. And if Nebraska can run the table against the division – a result I would say is still more likely than not – then a trip to Indianapolis in December for Nebraska is on the cards even with a 1-2 start. I knew I shouldn’t have said there’s no way your worst-case prediction could come true. I knew that as soon as I say “There’s no way x happens,” the football gods have to taunt me by causing x to happen! But now it’s coming true! It’s all coming true! Oh god what have I done? I’ve seriously freaked out like that about three times since Saturday. I really have to keep calm and just remind myself, if two plays had gone differently Nebraska could easily be 3-0 right now, on the way to 4-0 after one of the toughest non-conference schedules in my lifetime. Considering there were years that we weren’t breaking in a new coach, didn’t play two talented teams, and still didn’t have a chance to get to 4-0, that bodes well. That said, nobody wins championships by playing really good (or even fantastic) football for three quarters. Hopefully this coaching staff can get these guys to play a full game against stiff competition soon, something rarely seen in these parts since, what, like 1999? Very good analysis of the game, by the way, but I have to disagree with you (what a shock!) on one area: Jordan Westerkamp was the best player on the field for Nebraska, not Armstrong. I don’t mean to discredit Tommy’s gutsy performance or leadership, because he played some damn good football and without his 4th-quarter performance it would have been a blowout. But Westerkamp was the only guy who was doing the right thing and giving us exactly what we needed every time he touched the ball. He ran clean routes, did a pretty good Pierson-El impression returning punts, and most of all took the hard hits and held on to the football. Conversely, two of Armstrong’s interceptions were just killer (give him a pass on the second because it wasn’t really his fault and didn’t matter a whole lot to the game). The first one killed was had been a very positive drive that looked for all the world like it was going to end in a touchdown that would get us back to within two scores before halftime. The defense seemed to have stiffened some and had Nebraska gotten that score, I think the second half would have been completely different. Instead, Armstrong throws a pick in the red zone and we get more of the same in the second half. And I know, people excuse Armstrong because the receiver ran a different route than he expected, but come on! Armstrong is in his third year of being the primary starter. He has to have more awareness than to fling the ball right at a defender, I don’t care what the receiver does. I don’t think I need to explain why his third interception was awful. While Lewis’ foul gift-wrapped the winning field goal, the truth is Nebraska’s chances of winning were all but non-existent as soon as Armstrong threw that pass. Bottom line: Armstrong was good on Saturday, maybe even very good. Westerkamp was great. Interesting, I will admit I hadn’t thought much about Westerkamp in that vein. Here’s my argument. Yes, Westie was amazing, and he’s really rounding into an amazing receiver. But while he had a great game (5 catches, 95 yards), his performance wasn’t going to be difference-making. Almost by definition, it’s hard for a receiver to have that role, even a dominant one like Calvin Johnson or Odell Beckham. Heck, it was Brandon Reilly (whom I still find myself calling “Nate Swift” whenever I see him make a reception) who made a couple crucial catches in the fourth quarter. Yes, Westerkamp was great. But Nebraska doesn’t make that comeback without Armstrong — and doesn’t stay in the game to make the comeback, either. Maybe that’s the more accurate point I was trying to make. Thanks for the thoughtful response!